80 magnets of unsurpassed holding power! SAVE $22! There are dozens of uses for these handy magnets, from door catches, to holding tools and utensils, to toys and projects and refrigerator magnets. They can be glued with epoxy. 1/8" thick. 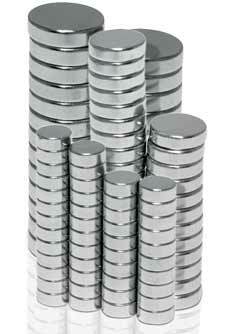 Includes 80 total magnets: 1/4" (30 magnets), 3/8" (30 magnets), 1/2" (20 magnets). The price for this assortment of hard-to-find rare earth magnets is half of what other suppliers are marketing. I use these super-strong magnets in the shop to make “holding boards” for storing equipment wrenches, note pads and other small items that seem to get lost in the shuffle when they are needed for use. 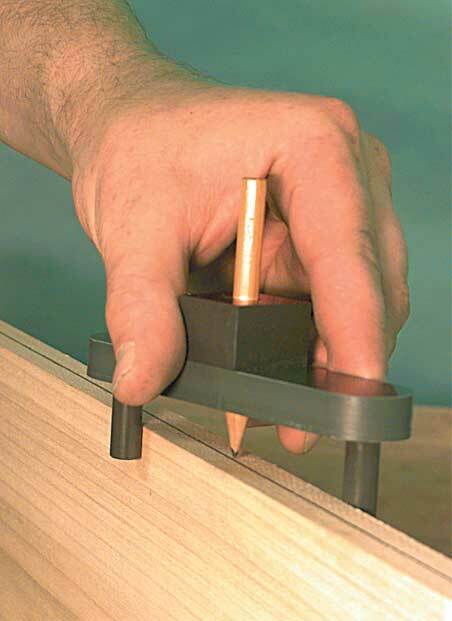 Use a spade bit the size of the magnet’s diameter and drill/countersink to its thickness. Then use a 2-part epoxy to secure the magnet. You’ll find an unlimited amount of uses for these handy items not only in the shop, but throughout the household. Try turning a few small knobs on your lathe and then countersink the smaller magnets. Apply a desired finish to make attractive refrigerator magnets. To avoid surface-marring, glue a thin piece of felt over the knob bottom. These custom holders also make unique gift items. I store the unused magnets in a small zip-lock bag, that conveniently attaches itself to a small metal wall plate. Great for frequent rotation and clamping! From small boards to huge blocks, these bench holdfasts make frequent clamping a snap. Simply drill a 3/4" hole to accomodate the holdfast and drop it in place. Give the head a firm tap with a mallet and you're ready to go. To disengage the clamp, tap the backside. The 8" clamp has a 4" reach. SAVE $7.90! Two Bench Holdfast clamps. I have had mine for a couple of years now and I can tell you they are very helpful when you need something held in place while you are sanding or hand planning. They are such a simple design but an extra pair of hands when you need them, I can sincerely say you won't be disappointed. 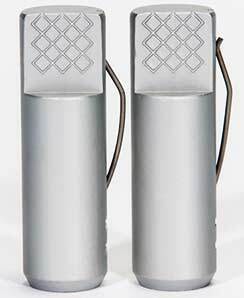 2 piece solid aluminum set. Solid aluminum bench dogs secure your workpiece in place. 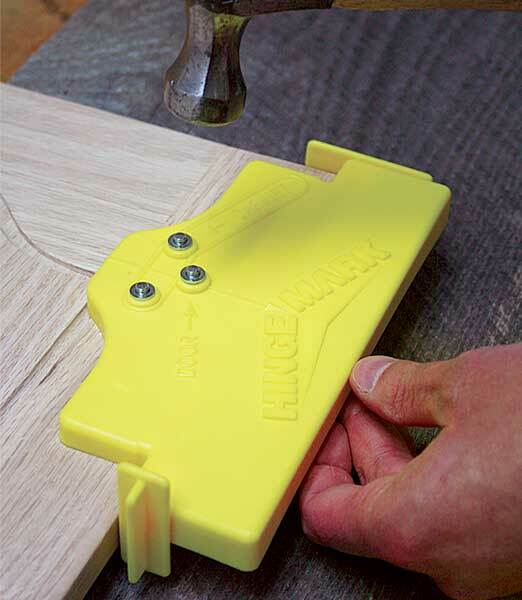 Designed to fit in a standard 3/4" pre-drilled workbench hole (or drilled anywhere you need it). These bench dogs also have a heavy duty side mounted spring to eliminate movement once inserted into the hole. Two piece solid aluminum set. Easy to use marking jig! 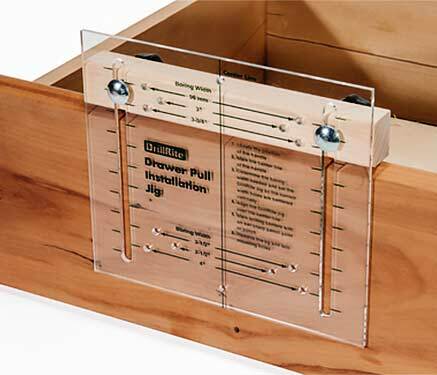 Simplify your drawer pull installations with this easy to use marking jig. Adjust the jig for the distance you want your pull from the top or bottom of the drawer front. Align the center line of the jig to the center line of your drawer front. Mark the pull locations using a pencil or center punch (not included). Works with drawer pulls of the following sizes: 2-1/2", 3", 3-1/2", 4" and 96 mm. SAVE $3! Determine exact centers on the edges of boards (up to 3-5/8" thick) when making biscuit slot cuts, drilling dowel joints, and assembly work. 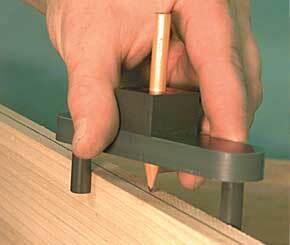 Insert pencil into center of jig and make your mark. Install European style door hinges quickly easily, and accurately! 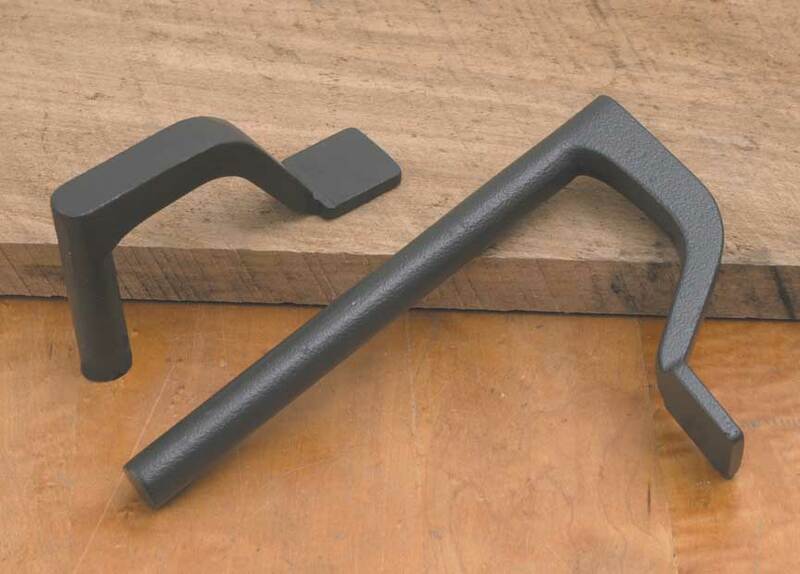 Position the jig on the door and tap the center punch marked "Door" with a hammer. Drill the 35mm cup holes. 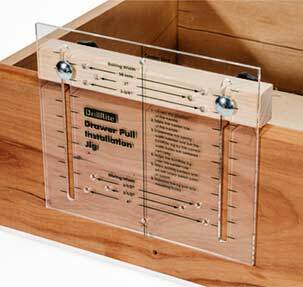 Move the jig to the inside of your cabinet and tap center punches marked "Cabinet". Install the mounting bracket to the cabinet and mount your door. It's easy! 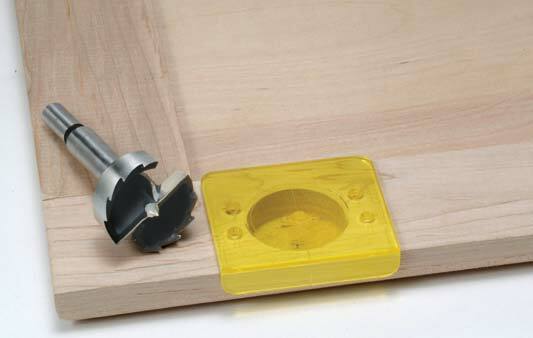 Includes a 1-3/8" Forstner bit and a concealed hinge locator template. Marking template is constructed of high impact, yellow tinted plastic. 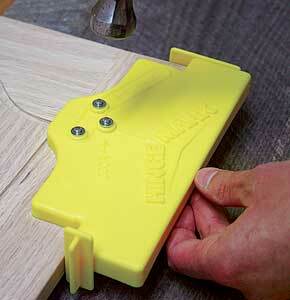 Quickly layout and drill for all brands of hinges. Use over and over. Instructions included.